Welcome to G M Trophy Shoppe! Preserve your memories and achievements with a custom commemorative product from G M Trophy Shoppe. Whether you’re marking the completion of your lacrosse club’s season, celebrating an employee’s 25 years of service to your company or want to make your awards ceremony that much more meaningful, G M Trophy Shoppe can help you select and customize the perfect items. 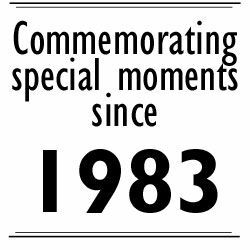 Let us help you commemorate the special moments and people in your life. We offer fast turnaround on all customization projects, and no job is too big or too small. Contact us to get a quote, or come on by to our showroom! We’re located in Unit 6 at the corner of Glidden and Rutherford. And while you’re here, don’t forget to check out our selection of darts and dart-related products. View our full catalogue of customizable products. Learn more about our engraving services.